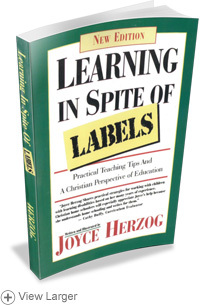 Learning In Spite Of Labels helps you to teach your child so that they can learn. We are all "labeled" in some area. Some of us can't sing, some aren't athletic, some can't express themselves well, some struggle with directions, and on and on! Realizing that we're all "lableled" helps us to work with those that have difficulties in areas we don't. Joyce's desire is to help you be the best parent/teacher you can be!